Die Styria Gruppe, zu der auch das WirtschaftsBlatt gehört, hat unter dem Titel „Digital Media Basics“ Seminaren zur Weiterbildung von Online Journalisten gestartet. Christian Moser, der das Projekt seitens der Styria Personalentwicklung leitet, lud mich ein, bei der Kick-Off-Veranstaltung einen Vortrag zum „Journalismus 2.0“ zu halten: Was bedeutet Online-Journalismus, welche Unterschiede gibt es zum klassischen Journalismus und wie sollten Redaktionen strukturiert sein? Hier ist das Manuskript zum Vortrag. Zur Ausnahme mal in Englisch. I have been working as a print journalist for the bulk of my career, for monthly and weekly magazines before I joined the daily WirtschaftsBlatt about a year ago. For more than 17 years I observed the evolution of the internet and mobile phones in the world of communication and media. I remember that in the mid 1990’s when discussions were still at a level where among others questions were asked like: “Are mobile phones going to be more than a tool for top-managers?” Another frequent question was: “Who really needs an internet-access at home? Isn’t the internet something that only huge companies and maybe universities need?” The big media houses were among the first to adapt the world wide web. Of course back then nobody could imagine the future. Who witch a 14.4 k modem would have? The internet well deserved its nickname “World Wide Wait”. Not even science fiction movies had predicted the massive changes that were so close at hand. The internet? The internet on mobile phones? There hadn’t been mobile phones in any science fiction movies except the “Communicator” in the original Star Trek series. 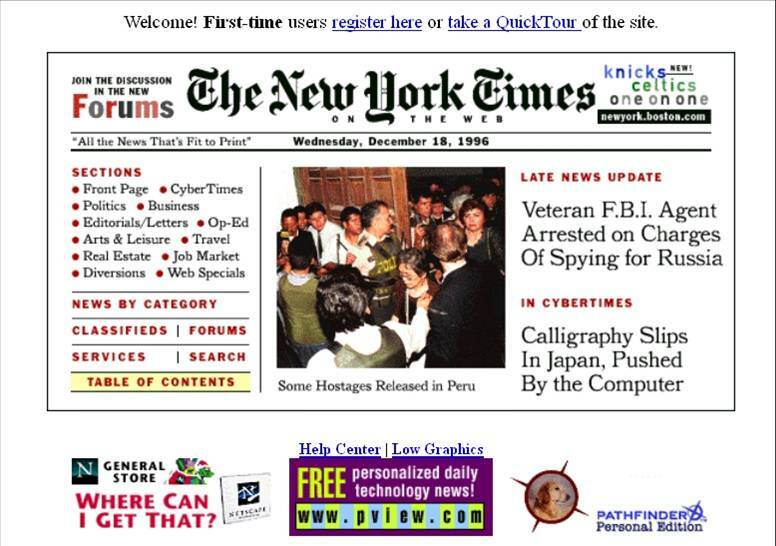 20 years ago nobody predicted a world where we have all the information we want and need delivered by palm-sized devices like the iPhone or an Android smartphone at a fingertip. Reality in 2012: The iPhone 5 and information at a fingertipThe last decade, and especially the last five years have been astonishing. The combined power of mobile communication and the internet heralded a new era. A really revolutionary era that not only shook the media world, the music and the film industry but even governments – we observed this during the Arab Spring of the year 2011 or the riots in England in the August of the same year. The power of the two technologies had a massive effect on media publishers throughout the world and their staff, notably the journalists. But while media houses have embraced the internet as a platform or at least try to do so many journalists still havent’t really got into it. It’s sad but true: The way most journalists work has hardly changed over the past 15 years. OK, in a modern editorial office we have a computer for everybody. The computers are connected to make the workflow easier. Yes, journalists use the internet to search for information. But this is only a passive use of the web. Besides that most journalists still do their work just as they did it ten or 15 years ago. Print journalists have shown a special resistance against changes. One of the main reasons is the way the work in editorial offices is structured. Usually print editors meet in the morning to set up the paper of the next day. They suggest stories that are accepted by the editor in chief. There they get their OK to do the stories and space is assigned in the next day’s paper. Then they return to their desks and do their research, make phone calls or maybe meet somebody. When all the needed information is gathered they write a text. Finished. Time to call it a day. Of course this description is very simplified. But it is a fact that print editors can rely on a bulk of people to do parts of the work that makes their stories worth reading. The photo department either sends out a photographer or picks a stock photo for the article, the layout and graphic department designs and finishes the page where the article is going to be published and a corrector will edit typing errors. The newspaper will be printed and published the next day where the same procedure starts again. It’s the online departement’s job to guarantee that the article can be also be found on the website of the paper. This is not the way it will work in future. For decades, and as for newspapers centuries, being in the media business was a very costly venture. It took and still takes a fortune and a long breath to enter the media business with a newspaper, magazine, radio- or tv-station. To run the business on a daily business and hopefully in the end earn a decent profit. The internet has given power to the people. Today everybody can enter the media business without taking financial risks. Not on a large scale, but it is possible. All it takes is a computer, a tablet PC or a smartphone, internet access and some time. Everybody can set up a webpage, start an internet blog or simply use social media platforms like Facebook or Twitter to interact with the whole world. To promote an opinion or to spread news. And if the opinion is catchy and the news is interesting, they will find an audience and be spread further. By the end of July Twitter had surpassed the 500 million user hurdle. And at the beginning of October Facebook stated that it had over a billion users. All of them use their computers and mobile phones not only to chat among friends but to spread news. Instantly and faster than we ever thought it could happen. A story was a good story if it gave an answer to these questions. Today these answers are no longer enough. The internet has changed and raised the challenges for the modern journalist. By the time a newspaper is published in the morning the “Ws” have already been spread via the various internet platforms. The information “what, where or who”, like “there is a fire in the street, police attacked with bricks” is no longer hot news because it has already been spread by the people. Which effect will it have? What impact does this have on my life? How do I have to react? If these rules are not obeyed a story won’t be read, even if there is some exclusive and hot news hidden somewhere in it. Even the hottest news will not reach its audience if a story a journalist does not obey these rules. There are different rules for different types of media. For print-journalism, television, radio and of course online-journalism as well. In online journalism one of the most important rules that an article can easily be found. News-portals of media houses are a good harbour for stories, if the portals are lean and well designed with and the stories are well positioned frequent visitors of a news portal will find and hopefully read the article. But there are thousands of people in the internet that might be interested in a particular story but do not visit a portal on a regular basis or might not even know that a certain portal exists. People are using search engines like Google or to a much lesser part Bing to check the internet for information on a special topic. They get information via Twitter, Facebook, RSS feeds or news aggregators like Flipboard that search the web content for special keywords which can be defined by the users. If somebody wants to renovate a building he will be interested in special information on that topic. In print an article might be headlined “Bright new sight”. If the story is accompanied with a good photo the reader will instantly know what the article is about. Another example: In print an article about the crisis in the European Union might be headlined “Quo vadis?” If the story is accompanied with a picture of a Euro coin or the European Union flag every reader will instantly know what the article is about. In online journalism headlines like these do not work. Not if the author of the article is aware that beside the frequent users of the portal there are more people out there. Google and all the other search engines or news aggregators check the internet for keywords. Keywords are linked to certain topics. “Bright new sight” or “Quo vadis” are headlines with virtually no keywords at all. They may headline an article on fashion, travelling, sport, food – almost anything. The search engines cannot link them to a certain topic. 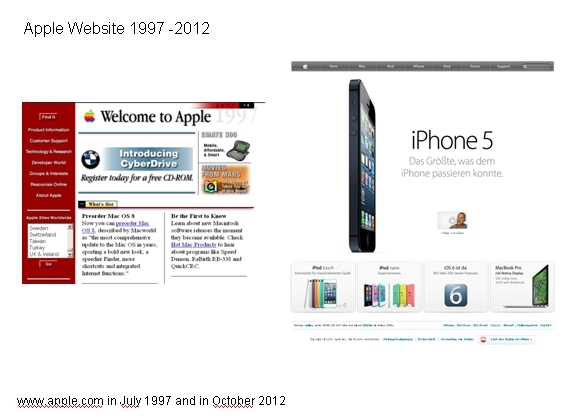 The differences between print and online storytelling also shows in use of quotes in the headlines of articles. At WirtschaftsBlatt we recently had an interview with Hannes Ametsreiter, the CEO of the Telekom Austria. The interview was held at a crucial time for the company. The Mexican America Movil, owned by the world richest man Carlos Slim, was just about to buy a 26 percent share of the Telekom Austria. In the newspaper the interview was titled with the quote “Last week I was in Mexico” No need to say that this title does not work in the internet. Search engines and news aggregators would more likely categorize the article as a private travelling report. A proper title for the internet could be “Telekom: CEO Ametsreiter negotiates with America Movil”. Out of a sheer journalistic perspective one might argument that the second title is boring and not very inspired. Indeed the journalists who led the interview did come up with this argument when we changed the title from version one to version two. They stopped complaining when we showed them screenshots that proofed that changing the title the article had a massive impact on its ranking in Googles search result. It moved from a position somewhere on page two to number three on the first page of the search results. Do we interfere with the principle of journalistic freedom when we amend articles that way? I dare say no. About 40 percent of the traffic on WirtschaftsBlatt.at comes from Google and the number of clicks that come from the other mentioned portals and engines is rising on a monthly basis. Every journalist has to keep this in mind. To be aware that it is not enough to write a story for a newspaper if it shall be featured online. That there are different rules and different success factors for different types of media. The intelligent use of keywords is not only essential within the title but also within the lead and also the first paragraphs of an online article. But there is more than keywords. Captions and alternative texts of the images used within an article, even the name of the file used, are also watched by search engines. This may sound a little technical but the alternative text is hidden behind an image and only shows up if for any reason the image cannot be displayed. It should give an idea what the article is about while the file name and the caption should be directly connected to the content of the image. Another important topic when it comes to search engines is to set links within an article, links that lead to internal or external content as well. The more links, the better the search result. Again the most effective positions are right at the beginning of an article. Search engine results can also be influenced with additional content. An article may feature more images in a slideshow, a download of pdf-documents, additional links to RSS feeds or blogs and so on. The more additional content is offered the better the ranking within the search results. Again: I strongly believe that all these search engine related actions do not affect the journalistic freedom but are absolutely necessary because the internet is a different type of media. An additional special challenge is to adapt the content for mobile devices, smartphones and tablet PCs. Print is not dead. Newspapers and magazines still have strong positions. Radio and television do so as well. But while the number of readers, listeners and viewers of these formats has been declining for years and years the number of visitors and users of internet and social media platforms has been rising. And still is. The mobile internet, smartphones and recently tablet PCs caused an enormous spin towards online. The digital natives, younger people who grew up with the internet, have got used to receive information in new, enriched media formats via new platforms. Information that consists of traditional narrative text, images, sounds, videos and links. The barriers that once were between newspapers, radio and television are blurring. The internet combines all the media formats we know. More, the younger generation reads news that is being suggested to them by their friends and followers on Facebook and Twitter. They follow the links recommended by these people and watch videos on YouTube instead of hearing radio. And no matter if legal or not they even know how to find the latest blockbuster movie in the internet. For free. Editors with a serious approach to their jobs can no longer neglect this. 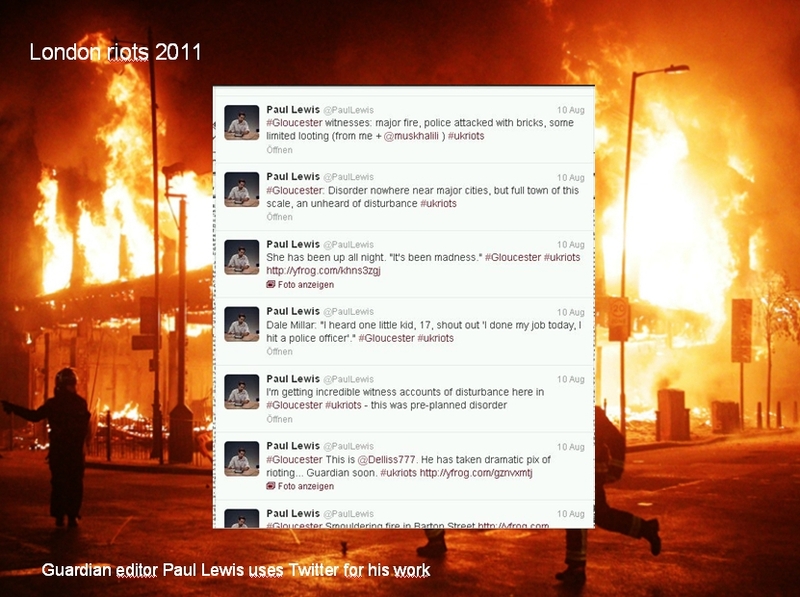 A good example is the work of Paul Lewis, editor at the British Guardian, during the London riots in the summer of 2011. Protesters organized themselves and spread news via mobile phones and social media platforms. Lewis used Twitter to find out where and when the people would congregate, He got there, did his research for the reports that were published in the newspaper. And he used Twitter promote his work within the protester-community. Any journalist working in a media house must keep in mind that newspapers, magazines or the internet are just different platforms to promote stories. That these platforms follow different rules and have different communities. 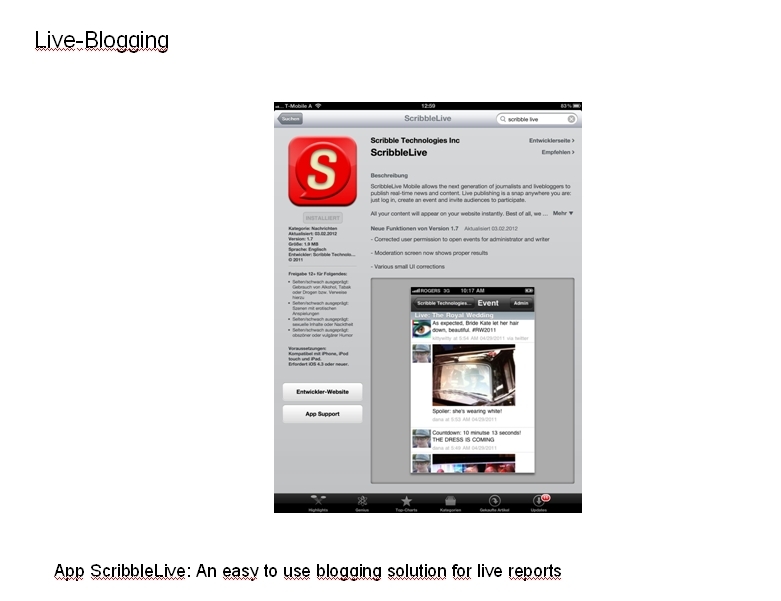 New technologies like ScribbleLive enable journalists to publish stories, photos, short commentaries and even videos almost live. An expectation that is fast growing among readers since the rise of the social media platforms. So the work of an editor is no longer finished when the text has been working on fits into a newspaper layout. The communication with the readers should start way before, during the research. And in order to reach a wider audience additional information shall be offered via internet. Via Facebook or Twitter, maybe tease the public with an interesting part of the story to go and by the newspaper the next day. And in the best case write a commentary or a blog entry. This cannot be done by a small online department within a large editorial office. The editor that writes a story has the best knowledge on a topic and is the one who must spread this knowledge using all the available possibilities. Photographers must use their cameras to film a short video footage and graphic designers must learn to animate their work for online use. For this we need a new structure in the editorial offices. The separation between print and online offices must be broken. Journalists must not think in one single format. An editor who does the research for a story also has to think about how the story can be told online, on a smartphone, on atablet PC: Which extras are needed? Can I add a video, a slide show or maybe an audio file? Which additional stories could promote the story in the internet? Yes, this means more work. For everybody that is involved. The bad news for the media houses is that they cannot reduce their staff. We will need even more journalists to be able to take the opportunities the internet offers today, to reach out to the audience on as many portals as possible. But if these opportunities are not taken the media houses will fail to attract a big share of its reader potential.